Combine confident body language with the use of power words to sell yourself in an interview. According to career expert Carole Martin, it's essential to use effective words and language when you're looking for a job, because you're often judged as much by how you express yourself and the words you use as you are by the ideas you're communicating. Replace common, blah-sounding terms with "power words" that convey positive, strong ideas to help you sell yourself to an employer. Discuss your experience using action words, such as "initiated" and "developed solutions," and communicate your "passion" and "commitment" to your job to convince a potential employer you would be a real asset to his company. Respond to questions about things you've done by using strong phrases that clearly specify accomplishments and quantify what you've done. Consider the difference between "I oversaw a production team" and "I led a team of 10 people to improve production techniques, resulting in a 150 percent increase over the previous year's production totals." While the first phrase pretty much just says you were there, the latter one indicates you provided leadership, improved processes and achieved meaningful results for your former employer through the use of power words such as "led," "improve," and "increase." Sell yourself in a way that highlights how your specific skills or abilities would make you an asset to the company, according to Lauren Brookmeyer of Aol Jobs. Avoid giving the impression that you're looking for a learning opportunity or regarding the job as just another step up the corporate ladder. For example, highlight your language proficiency, professional certification or overseas work experience as an asset the company would benefit from by hiring you over another candidate that might not be able to offer those skills. Stress how you can "communicate" effectively with the company's international clients because of your "fluency" in French and your previous "immersion" in another culture. Use power words and phrases that convey action, capability and confidence. 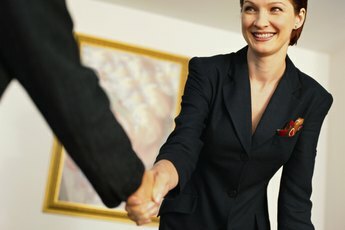 Would you rather hire a candidate that said she "ran the annual fundraiser" or the one who told you she "identified and landed" 10 new corporate sponsors and "filled a larger venue" than in previous years, resulting in the "most successful fundraising effort" in the organization's history? And if you inherited this project at the last minute when someone quit unexpectedly, talk about how you "hit the ground running" or "rose to the challenge" to indicate you are able and willing to take on complex tasks with confidence. What Should You Say Is Your Strongest Attribute in an Interview?